Trading double bottom pattern is good trading strategy. A stock pick of the day based on this chart pattern offers several trading opportunities. You can trade such a stock in multi-day strategies as a swing or position trade. It is also possible to create intra-day trading strategy solely based on chart patterns like double bottom. The first task that you should do before any trade is to find good candidates for your strategy. If you are a day trader then you have probably list of stocks you prefer to trade during a day. So you can go through this list and analyze every chart manually. But if you are swing or position trader then it is more practical to use some market screener that can generate a list of tickers that actually created a double top chart pattern. You can use FinViz site with free market screener. This online market screener have already predefined filter looking for double bottom chart pattern on the charts of stocks traded on US exchanges. The whole screening process takes only few steps. First select the “Screener” option from Main menu. Then find a “Signal” field located right under main menu row. 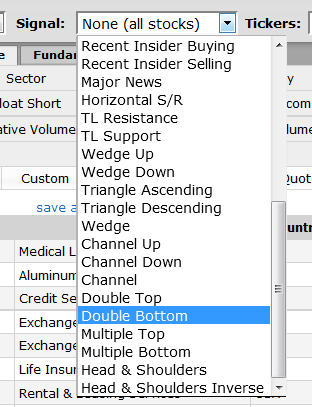 Select “Double bottom” type of signal and the screener will generate a list of stocks with this chart pattern on their daily chart. Here is a typical example of double bottom chart pattern recognition on the chart of PLCE. As a final step you have to go through the list produced by this screener to manually analyze charts. You have to select the best stock pick of the day for a possible trade. Sometimes you can find no single good opportunity. It is not a problem. There are days when you cannot use this double bottom trading strategy. It is better to have several different strategies in your trading system to handle such situation. There is also another online website that offer alternative stock screener. You can check ChartMill site and its screener feature.